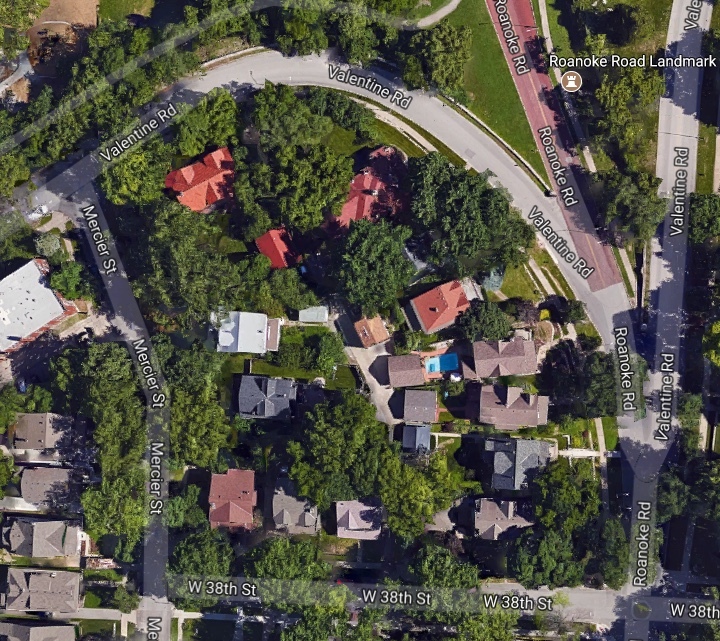 On this block of Valentine Road west of Southwest Trafficway, most families came and went quickly over the years. One family, the O’Mearas of 1209 Valentine, stayed for decades. Census records show Richard O’Meara headed up the household in the 1920s and 1930s, and his widowed wife was still there in the 1940s. Contrary to the way some folks perceive the past, Midtown families did not always stay in one place for many decades. It was more typical for people to move in and out of homes, whether rented or owned, as family members died, married or moved to another neighborhood. 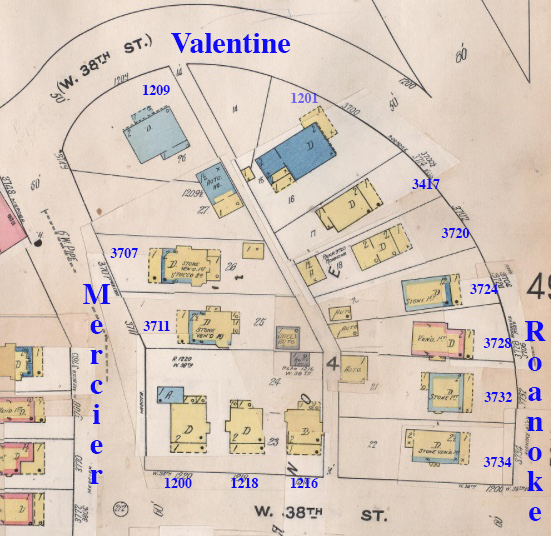 This was true of the block bounded by Valentine and Roanoke, W.38th Street and Mercier, where only one family that lived on the block in the 1920 was still there in 1940. The thirteen homes on the block were built for the most part after 1910. The home at 1209 Valentine was put on the market as a rental in 1914, while a new bungalow at 1218 W. 38th went on sale in 1922. Like many blocks of Midtown, it was common for widows to be listed as heads of household, and it was also common for grown children and extended families to share homes with parents. As part of our Uncovering History Project, the Midtown KC Post is taking a look at each block in Midtown, including a set of 1940 tax assessment photos which is available for many blocks. (Many people seem confused by the tax assessment photos, which all include a man holding a sign. Here’s the story behind them). Today, the block bounded by Valentine and Roanoke, Mercier, and W. 38th Street. The census records from 1920 to 1940 shows the pattern of families moving in and out. Beginning with the households that were on the block in the 1920 census records, you can see that only one remained in 1940. A recent aerial view of the block. 3734 Roanoke: Colonel L.T. Bingham, a 64-year-old millinery worker, lived here in 1920 with his wife Clara, three daughters and two sons. Colonel Bingham and his wife, son and daughter were still here in 1930. 3707 Mercier: In 1920, Dentist Eugene Shattuck owned this home, shared with his widowed daughter Lela Anderson and her two children. They were gone by the next census. 3711 Mercier: This household was headed by construction engineer Walter C. Polk. His wife Evelyn and two daughters also lived in the home in 1920, but had moved elsewhere by 1930. 1220 W. 38th: Furniture merchant Charles H. Simms rented this home with wife Sarah and a daughter and a son. The Sims family was still living here in 1930, but their son had moved out. 1218 W. 38th: In 1920, widow Mary Fredrick headed up this household, shared by her daughter Bernice, cousin Corinne Blakey and boarder Lucille Dixon. Ten years later, Mary Frederick still lived in this home, now with only her daughter. 3732 Roanoke: Jewelry retailer Samuel Fuhrman owned this home with his wife Tina and two sons in 1920. 3728 Roanoke: Retired Martin Ham shared this home in 1920 with his wife Jane, a son, daughter and son-in-law, but had moved on by the next decade. 3724 Valentine: 43-year-old widow Francis Van Boskirk lived here alone in 1920 and was gone in 1930. 3720 Valentine: Machine shop owner Edward B. Valot shared with home in 1920 with his wife Hermine and two daughters. Edward B. Valot, now employed by the Board of Education, still lived on the block in 1930. The Valot household had expanded to include three daughters and a boarder, Mabel Boruff, who worked as a candy maker. 3714 Valentine: In 1920, this was the home of 46-year-old widow Mary Gent and her two daughters who worked as stenographers and three sons, a cattle buyer, a chauffeur and a student. By 1930, Mary had died and her son Leo, a plasterer, was head of the household, living with his wife Irene, a daughter and a son. 3700 Valentine: In 1920, lumberman Daniel Sanders lived here with his wife Sallie, a daughter, a white servant named Jennie Swanson and a black servant named Nona Webb. The family was still here in 1930, when Daniel was working as a lumber salesman and Sallie was a Christian Science practitioner. The servants were gone. 1209 Valentine: This large home housed liquor wholesaler Richard O’Meara, his wife Margaret, three daughters and a son in 1920. A decade later, Richard O’Meara was a dairy company treasurer and still lived here with his wife Margaret and a daughter. In the 1940 census, widowed Margaret headed the household, shared with daughters Maude and Patricia Sigman. 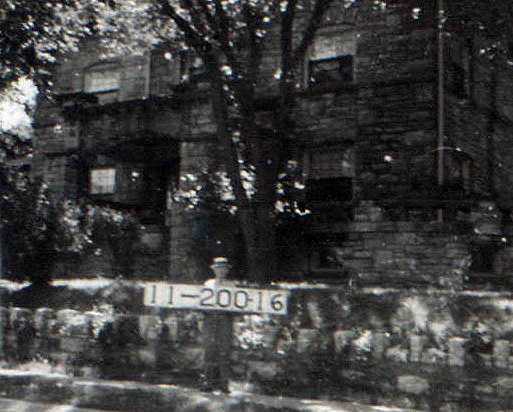 The slideshow below shows the rest of the homes as they appeared in 1940. I will add you block to the list. Fantastic stuff, thanks for posting. I’m at 4026 Holly St – if you get around to our block I know everyone would be interested!